Color is one of the essential parts of life for me. Today we’re dissecting it in part 4 of a series. I cannot function without color, quite literally. I have a neurological condition called synesthesia and almost everything I think about has color. My phone number is a series of colors; that’s how I remember it (light green, periwinkle, periwinkle, ocher, ocher, icy silver, dark green). Your name is either a series of colors or one dominant color, depending on the letters, so when I meet you I subconsciously and involuntarily assign your name some sort of color. This goes on and is quite complicated. You can read about synesthesia here and test yourself for it here. It can be hereditary and apparently I got it from my mom and gave it to at least one of my children. I love color. So, today we’re taking one of my favorite subjects and pulling it apart and putting it back together… on a preschool level. We’re making colored sun-catchers and rainbows. The sun-catchers are fun because you can observe colors blending and also separating. 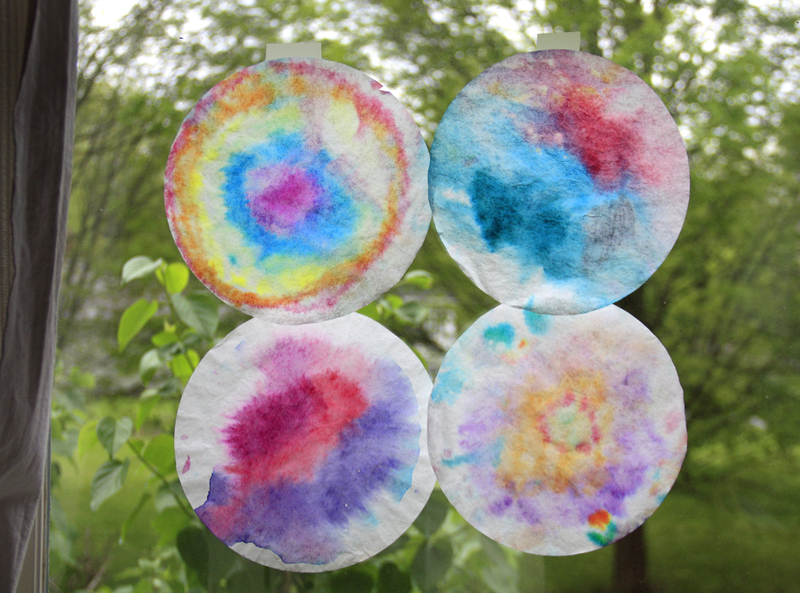 Color a coffee filter as completely as you can with markers. When the design is done, spray with water and watch some colors blend and some colors separate. Red, yellow and blue blend pretty well, while secondary colors (purple, green and orange) might mix to make a new color or might separate out into their primary components. 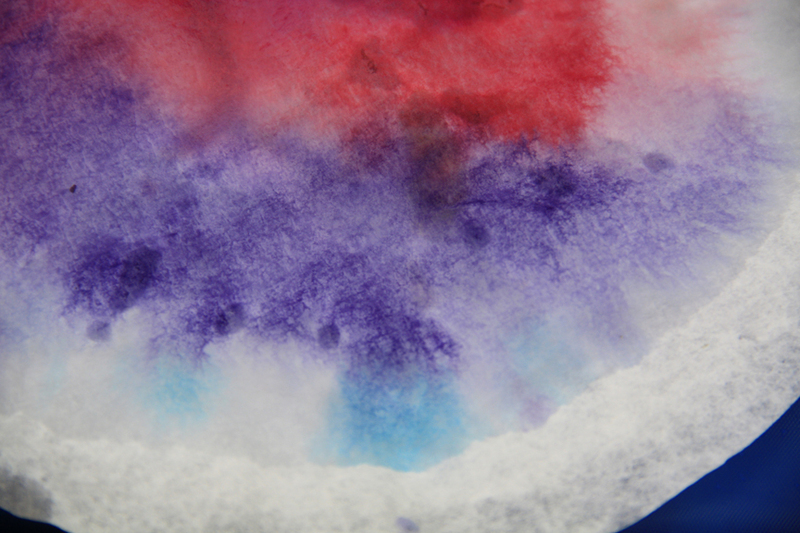 See how this purple dye clearly bled out its blue part? Some colors mix to make others and sometimes the mixed colors can come apart. Adding colors in the subtractive color system is really obvious when mixing 2 colors of paint or colored water… and also fun when mixing ketchup and mustard. : ) You can read more about basic color theory here. Let the filters dry on an old towel (the dyes stain everything they touch, so be careful). When they are dry, hang them in a sunny window to enjoy. Next, we move over to additive color theory, or color resulting from light rather than pigment. I keep a few crystals hanging from a south-facing window to make rainbows in the sunshine (you knew I was related to Pollyanna, didn’t you?) and we’ll use a few of those to see what happens in a dark room when we add a focused beam of light. 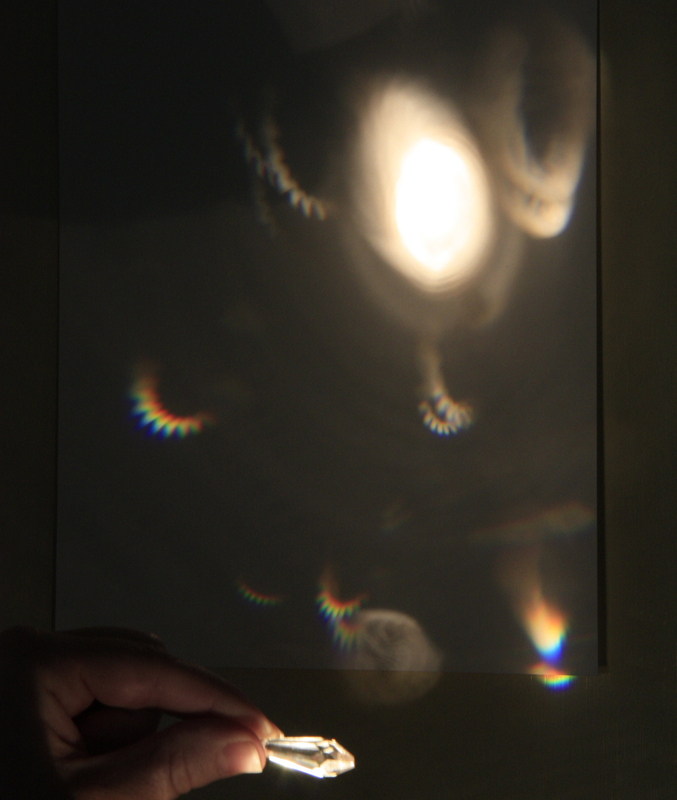 Using a blank white wall (or a sheet of paper taped to a wall), hold a focused flashlight up and bring a prism in front of it, turning the prism to watch the colors unfold and dance. Kids really enjoy being the rainbow-maker. This experiment quickly evolves into shadow-making, too. Have fun! Happy Sci Fri to you! Music for today’s experiments: Kermit the Frog and Israel Kamakawiwo’ole…. Advanced rainbow-making: see this Youtube video by the clever folks over at Quantum Pie. This entry was posted in Science Fridays and tagged acitivities for kids, color, fun, preschool science, rainbow, summer fun by Maren. Bookmark the permalink.